At the time of the inception of the South Staffordshire Railway (SSR), rail traffic across Birmingham was seriously impeded by the restrictive nature of the route arrangements around Curzon Street and Lawley Street stations. This new railway was intended as a through route for traffic to and from southern England and south Wales to northern Englan, that would bypass this bottleneck. Its route northwards from Oxford, Worcester & Wolverhampton Railway at Dudley, would provide links to the Great Western Railway at Wednesbury (then under construction) and the London & North Western Railway at Bescot and Lichfield, reaching the Midland Railway at Wichnor Junction, with running powers onwards to Burton. However, the intention was not entirely achieved. In the first place, the sprawling industrialisation of the West Midlands area that the line traversed proved to yield so much traffic, that its capacity was fully taken up in servicing these needs. Secondly, the amount of through freight traffic was only ever minimal, mostly because the early routes were soon revised to virtually eliminate the bottleneck. Through passenger traffic over the SSR never materialised. Nonetheless, this line was successful with the more modest nature of its traffic, which with the development of the Cannock Chase coalfield reached enormous proportions in the first half of the 20th century. Local passenger traffic grew to acceptable levels, but was destined to be withdrawn from the South Staffordshire Railway main line and its branches. The exception was the Walsall to Birmingham commuter service which mostly used the LNWR lines. The promoters, owners and lessees of the line had numerous other local busines interests which not only complemented the railway, but provided employment for the local populace. The individuals involved earned the respect and gratitude of the local communities, although such is the nature of mankind that this has not been entirely remembered. The mostly local traffic drew on a number of interesting operating procedures, as well as a wide variety of locomotives from those of the original South Staffordshire Railway, through a miscellany of LNWR and MR types and onwards through the standard LMS and British Railways types, well into the modern diesel era. Eventually the middle portion from Walsall to Anglesea Sidings (Brownhills) was closed entirely in 1984, and onwards to Lichfield City in 2001. The southern half of the route, from Dudley to Bescot was closed entirely in 1993, although its future as part of the Midland Metro system appears secure. 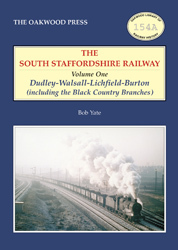 In this volume we look at the construction and development of the main line, as well as the small branches to Dudley Port, the Darlaston Loop, and the Princes End branch, plus those mineral lines extending eastwards. A5 format, 312 pages, 290 illustrations.